Click here to select a Service Plan Option. 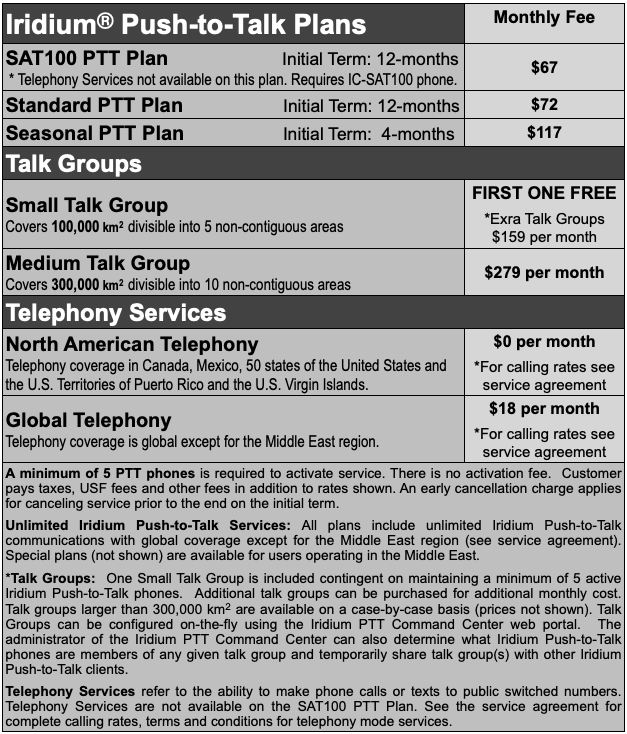 Iridium Push-to-Talk (PTT) plans require the use of the Iridium Extreme PTT satellite phone. These phones can be operated in either push-to-talk mode or telephony mode. 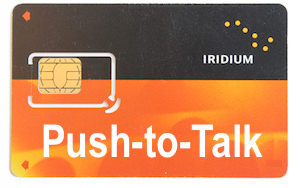 In push-to-talk mode, unlimited push-to-talk communications are available with the other Iridium Extreme PTT phones active in the same Talk Group. In telephony mode, the Iridium Extreme PTT satellite phone becomes a conventional Iridium phone that can make phone calls to public switched telephone numbers and send or receive SMS messages. Special discounts are available for customers activating more than 10 Iridium Extreme PTT satellite phones. Please call 615-889-8833 for more information.